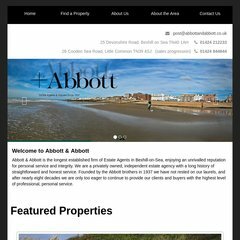 abbottandabbott.co.uk Abbott & Abbott Estate Agents in Bexhill on Sea, East Sussex ..
Its 2 nameservers are ns1.active-ns.com, and ns2.active-ns.com. It is hosted by Catalyst2 Shared Hosting Network (Northern Ireland, Belfast,) using Microsoft-IIS/6 web server. The site is programmed for ASP.NET. PING www. (84.18.207.43) 56(84) bytes of data.